Mrs. Lyan lost a lot of weight even under the good care of the doctor. Her health condition made Mr. Lyan’s heart ache. But a promise is a promise! It can’t be changed! Mrs. Lyan had just let it be. Upon this Marriage Revolution, the relationship between Yu Wen and her mother dropped down under to 0 degree. Right after Yu Wen heard that her mother regained consciousness, she ran to her mother’s bed side. But as soon as her mother saw Yu Wen, she closed her eyes and turned her head away from her. Ever since that each morning and evening when Yu Wen went to her parent’s bedroom with her best regards as she usually do, Mrs. Lyan would not say a word and even not looking at her unless her father was around. Yu Wen always stood in front of her mother until Wong Ma pulling her sleeve to imply her it’s time to leave. Her mother treated her as a stranger. At Yu Wen’s childhood, only when she was learning the Princesses Etiquette, her mother was very strict on correcting her postures, but their relationship was never being as bed as strangers. Yu Wen understood that her mother loved her, Her mother wish to see her only daughter marry to a matched marriage to have a good life. But she herself knew that she would never wanted to become a daughter-in-law of Mrs. Dzo, and ended up the same way as her high school classmate. Yu Wen aspired to a blissful marriage. Nevertheless, she couldn’t drop her mother’s love as well. Her mother could only see that Dz Yun was a impoverished student. But she never learn the Dz Yun was born in a scholarly family for generations. Some of Dz Yun’s ancestry were officers at the imperial court. The Ho’s family was one of the most famous celebrities in HeNan. But to Mrs. Lyan scholarly family for generation would never be compared to a blue blood family. Struggling between the love of her mother and a blissful marriage, tolerated with her mother’s coldness every day, Yu Wen couldn’t take any more. She was devastated and her heath collapsed. Every day after 12 noon, Yu Wen began to have some fever not too high but coughed a lot. Traditional Chinese Doctor diagnosed Yu Wen of Non-communicable TB. Dz Yun did as Mr. Lyan told him. He asked uncle Bu to go to Lyan’s residence to proposed the engagement for him. Uncle Bu was a close friend to Mr. Lyan. He visited Mr. Lyan residence frequently. Uncle Bu have met with Dz Yun quite often, was of the opinion that Dz Yun was a honest and gentle boy. He understood Dz Yun and Yu Wen loved each other. He was willing to be the matchmaker. Matchmaker was a very important character in those days. Without a matchmaker there would no marriage. Step one: For the boy’s side — You should have a matchmaker who should knows both persons who involved with this engagement. The matchmaker should bring a piece of red paper with the boy’s date of birth and eight characters of a horoscope to the girl’s parents. The girl’s parent will check with a fortuneteller to see if this boy matches with their daughter’s date of birth and eight characters of a horoscope. If there is no problem and they think this boy may be an ideal son-in-law to be, they would accept the red paper and give their daughter’s birth date and eight characters of a horoscope to the matchmaker to bring to the boy’s parents. After everything was OKed, the matchmaker would exchange the *”Small Dragon and Phoenix Card* for the two parties. One addressed to the girl’s father, one to the boy’s father. If both side accepted which means the engagement is half way to success. If any of the two parties refused to take the Card, There will be no more engagement. 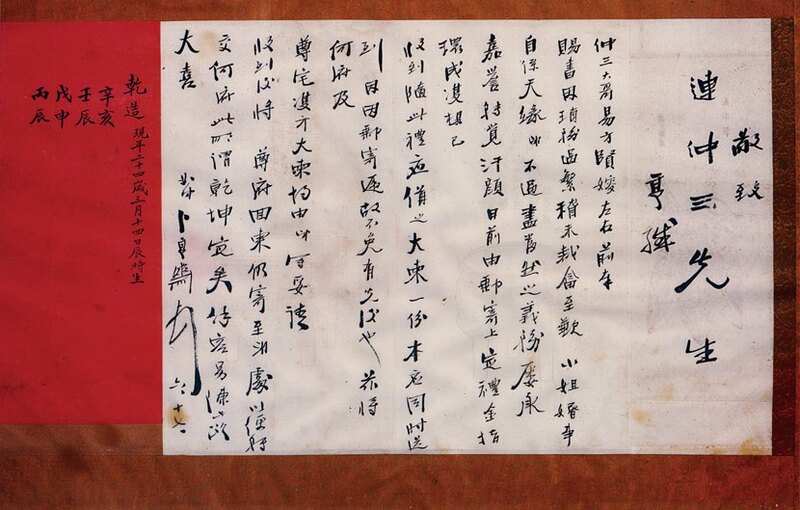 *”Small Dragon and Phoenix * – Two pieces of red paper(as the picture showed) carried both boy and girl’s date of birth and eight characters of a horoscope. One addressed to the girl’s father, the other addressed to the boy’s father. These cards should be written by the matchmaker with his name and seal on them. The picture above was from my grandfather to my maternal-grandfather , asking for permission the engagement.